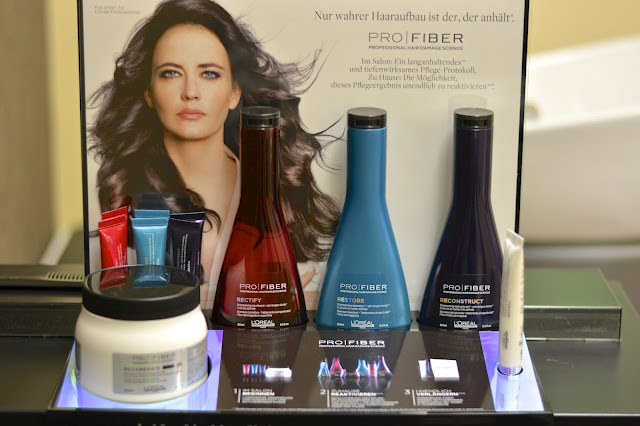 If you follow me on Instagram you may already know that I was lucky enough to travel all the way across Switzerland to try out the brand new L’Oréal Professionnel range, Pro Fiber, thanks to Eileen from Coolbrandz. As it’s my first video it’s obviously faaaaar from being perfect, I’m very stressed out and seem to have forgotten how to smile but it was still a great new experience and I hope you like it too. I’d suggest watching the video first to see what my adventure was like and then to finish with the post where I’ll talk more in detail about the products and the results. When I arrived at the salon, I was welcomed by the charming Alexander who led me to a little niche at the back. It was like having a little salon just to myself. I felt like a princess even before I had the hair of one. So there is something for everyone ! All three range have a different scent and are all delicious ! On me, the scent lasted until I washed my hair and reminded me of holidays. I love it ! To determine the damage level of my hair, Alexander used an app to ask me a few questions. This step doesn’t last longer than 5 minutes and you instantly get the result on the app. You also receive an email with your results for future reference. It’s a hair profile or history of what my hair has been through if you prefer. On the left you can see the different things that may have damaged my hair. There aren’t very many as I use very little heat on my hair and don’t colour or bleach it. In the middle is an estimation of how many times I washed and brushed it. Finally, on the right, what’s most interesting to us, the level of damage, in my case, 1. Like I said, I do very little to my hair that may damage it so it isn’t too badly damaged. The range that is most suited to my hair is therefore the pink one, Rectify. 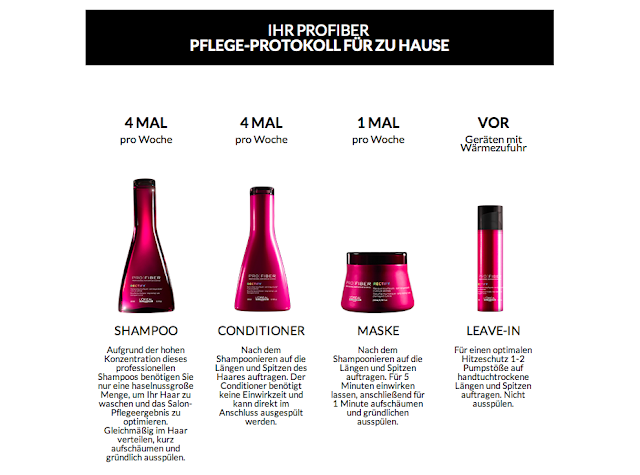 Each sub-range is made of a shampoo, conditioner, mask and leave-in serum that you can purchase and use at home to extend the effect of the salon treatment. 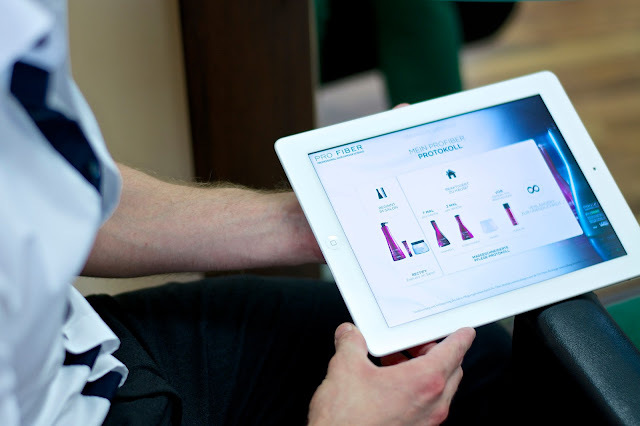 The Re-Charge (white box in the background below) is there to reactivate the deep treatment applied in the salon and is the same for the three sub-ranges. Once the appropriate range has been determined, the treatment can begin ! Alexander started by washing my hair with the Rectify shampoo, twice. 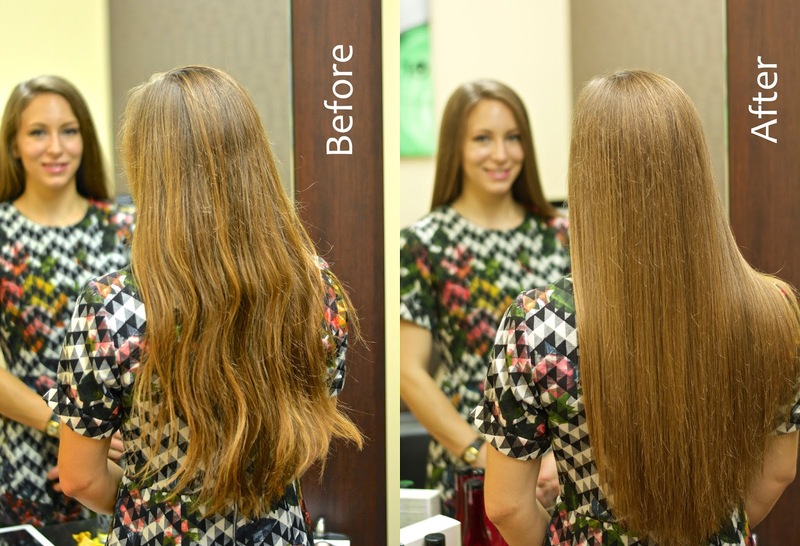 Once to really clean it and once to prepare the hair to receive the treatment. As you can see on the picture below, the shampoo lathers very beautifully and it’s really enjoyable. 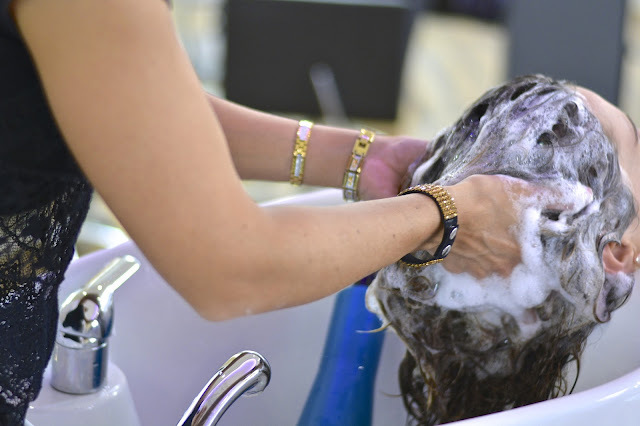 Once the hair is really clean, we go on to the deep treatment. 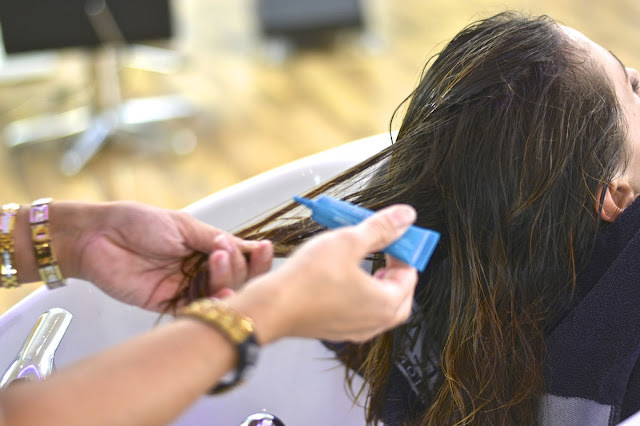 The treatment is applied on towel-dry hair, in little pieces of hair at a time to make sure that all the hair is evenly coated. Directly on top of this deep treatment, Alexander applied the mask. You then leave both treatments into the hair for about 5 minutes. It’s that quick you won’t even get bored. Once I’d waited 5 minutes, Alexander added a little water to emulsify the products into the hair. He told me that this makes the treatment work better and deeper into the hair. He also told me that we should do that every time we apply a conditioner or a mask. Take a few seconds to emulsify with a little water before rinsing it out. Once it was all rinsed out, Alexander blow dried and straightened my hair to reveal the full potential of the treatment. You can clearly see that my hair is silkier, shinier and gives the impression of being a whole rather than a bunch of locks attached to my scalp. What the pictures can’t tell you though is how soft it feels ! It’s also very light and airy and moves very swiftly when I turn around. I’m astonished by the difference a 5 minute treatment can make !!! My hair feels soft all the way to the very ends that are visibly less dry and damaged. So I left the salon with a gigantic smile on my face, silky soft hair and all the products needed to extend the effects of the treatment at home. What’s nice with this new treatment is that you don’t have to change your routine an awful lot. 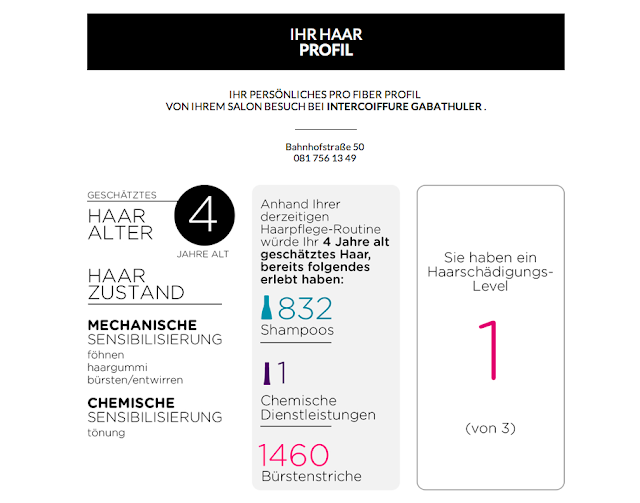 Indeed, when I answered the question on the app, it asked me how many times I’d wash, condition or use a mask on my hair and these numbers don’t change with Pro Fiber. What you do is you keep the same rhythm and just change the products you’re using. Easy ! 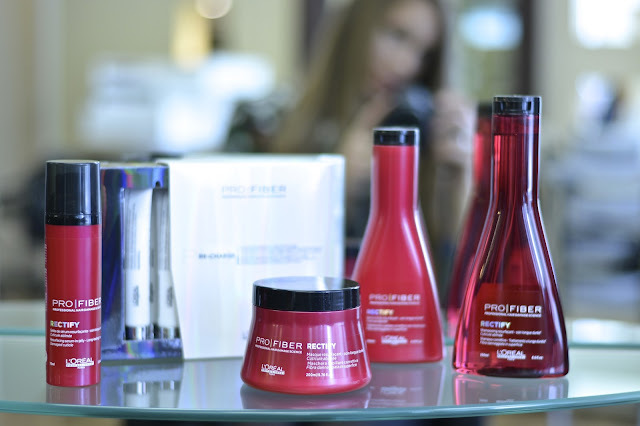 The one difference is the Re-Charge part of the treatment that you have to apply every 4th wash in order to bring back the goodness of the treatment applied at the salon. 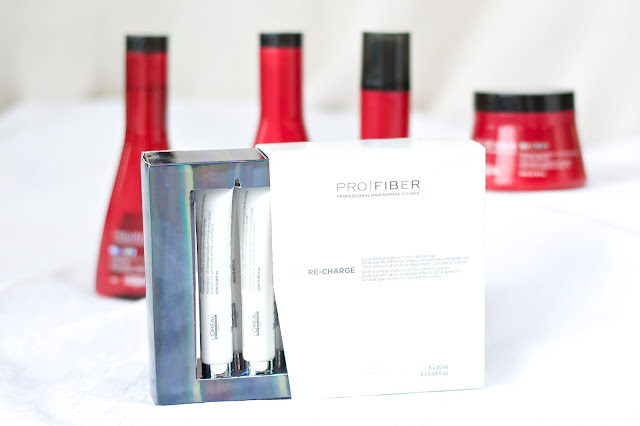 You apply the Re-Charge just like they do at the salon, lock after lock, in order to evenly coat the hair. You can also apply the conditioner or the mask straight on top of it, like they do and don’t forget to emulsify with a little water once you’ve left it in the hair for 5 minutes before rinsing. Today, it’s been a little under a week since I’ve had the treatment and the first step (at the salon) really convinced me ! 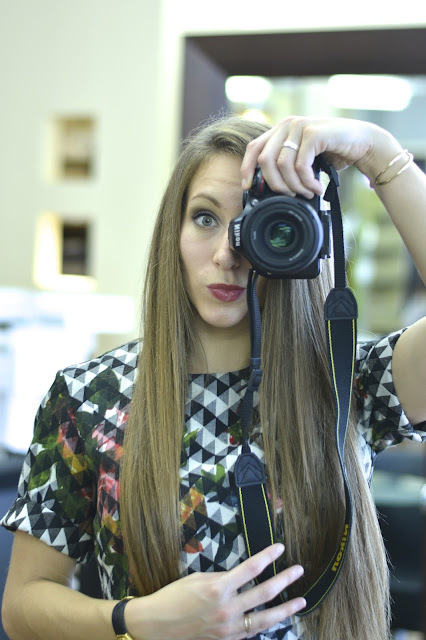 My hair is visibly healthier, softer, shinier, lighter all the way to the ends. As for the rest of the treatment, keep your eyes peeled and I’ll keep you updated as to how it goes. More info on the treatment can be found on their website, here. 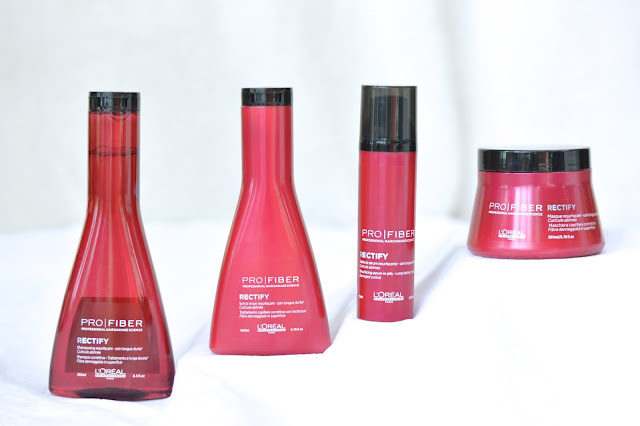 Have you heard of Pro Fiber ? Tempted ? This sounds like quite an experience 🙂 And your hair looks lovely!